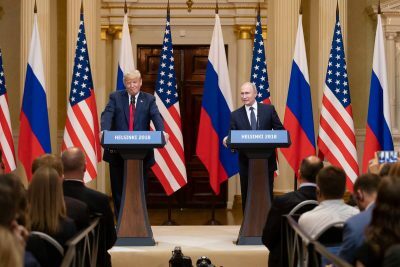 Even days after President Donald Trump’s bizarre appearance in Helsinki alongside a cool, composed President Vladimir Putin, it’s hard to tell what happened. But it certainly was entertaining. But after the presidential meeting, Trump replied to reporter’s questions by saying he believed Russia had no role in attempts to bug the Democratic Party during the election. Outrage erupted across the US. ‘Trump trusts the Russians more than his own intelligence agencies’ went up the howl. Trump is a traitor, charged certain of the wilder Democrats and neocon Republicans. Few Americans wanted to hear the truth.